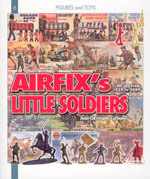 Plastic Soldier Review - "Airfix's Little Soldiers"
Home > Features > "Airfix's Little Soldiers"
Airfix will always have a place in many a child’s heart, no matter how old they are. It is to be presumed that Jean-Christophe Carbonel is one such as he has written this book about all those little plastic figures that Airfix produced until the early 1980s; figures which for many of a certain age were virtually all there was. Although nothing new has been added to the range for over a quarter of a century, the popularity of many remains to this day, and even those with no interest in the hobby now cannot help but raise a smile at the memory of those toys of yesteryear. For all those this book promises to be an indulgent pleasure. This volume is 106 pages in length, of which almost half is devoted to a narrative of the range of OO/HO figures as they appeared chronologically. The style is not encyclopaedic but more the telling of a story, going through each set and providing comment or anecdotes on some while mentioning others only in passing. Apart from the author’s own comments the text quotes from the original Airfix Magazine announcements, several magazine reviews written at the time of release, and our own humble website. Much the greater part of these first 53 pages however is taken up with numerous high-quality colour photographs of the various box designs (both front and back) that the figures were delivered in, along with images of representative samples of the figures themselves. The next section goes into some detail about the various play sets and buildings, again lavishly illustrated with box artwork, followed by a rundown of the subsequent withdrawals and reissues of sets over the years. After that we find a section looking at all the other brand names under which Airfix figures have appeared, but then the book starts to drift away from the subject at hand as it considers "Airfix’s Competitors", which is to say other manufacturer’s plastic figure output up to 1982. Finally there is a section listing each Airfix set and giving a brief review and some further notes. This article is based on the English language version of this book, which appeared shortly after the French original. However while the translation is mostly good there are the usual crop of grammar and typo errors which most books suffer from today thanks to the avoidance of expensive human proof reading. To be fair this is no worse than most books published today, but the most obvious error is page 51, which suddenly switches to entirely French language! Presumably later editions will rectify this fault. We enjoyed the main section discussing Airfix’s output, although by far the main appeal of this section, and of the book in general, is the large number of good photos of boxes. Inevitably this leaves little room for the text, so most sets are quite briefly covered when we would have liked to have learnt more about each one. The section on playsets is a little more informative and certainly enjoyable to read, but the sections on reissues and Airfix figures marketed by others are really there for completeness and reference, adding little to the enjoyment of the book. The discussion on output from other manufacturers is interesting but again is heavy on the great illustrations and light on detail. The final section is in some ways a mini text-only version of our own site, and while interesting in itself we couldn’t help thinking that we would have preferred this information to have been included with the discussion of the sets in the first part of the book. As we have said, the book has many quotes from this website (all of which are credited) along with one of our pictures (which is not), but we should say that we played no part in the production of this book, nor are in any way associated with it or the authors. If we were then they might have spelt our name correctly, and included our web address in the bibliography. However we take this absence as a compliment, suggesting that everyone is already so well aware of our existence that they do not need to give our address! The rogue page in French gave us the unexpected delight of seeing our own words repeated back to us but translated into French. The many quotes from PSR also brought a smile to our faces as our Airfix reviews were obviously amongst our first, and our style has changed over the years as well as our drift away from brevity! This is a quality book (as you would expect of a book published by Histoires & Collections), and it makes great use of interviews with several people involved in the production of figures to give some interesting background information, as well as some short articles on how sets and boxes are produced. However the best bit is all the photos of box art, which will cause many a reader to wallow in nostalgia as they turn the pages. If you are considering obtaining this book then you have probably already made your mind up. After all, this book is unique in terms of the subject matter, and since you have read right through this article you are probably just the sort of person who will enjoy it.